Jane and I woke up early at the Harbor View Inn in Seward. 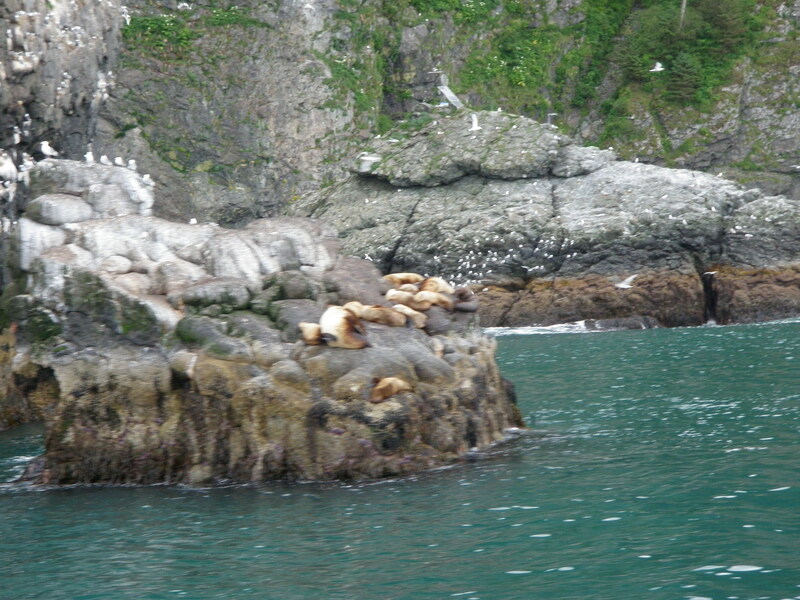 We were eagerly anticipating our day on the Kenai Fjord cruise. We had a quick breakfast of (you guessed it) muffins in our room and headed down to the dock area and parked in the designated cruise parking lot. We were actually a bit early and had time for coffee and tea. We knew the speed of the boat over the water would create a breeze and chill, so we both took our warmest clothes and wore many layers. 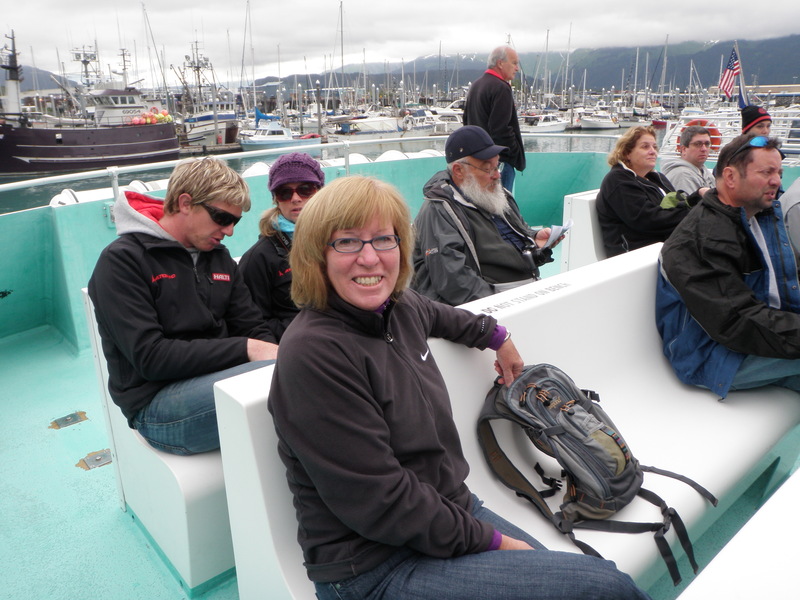 At the designated time we boarded the boat and initially sat in the aft of the upper deck. 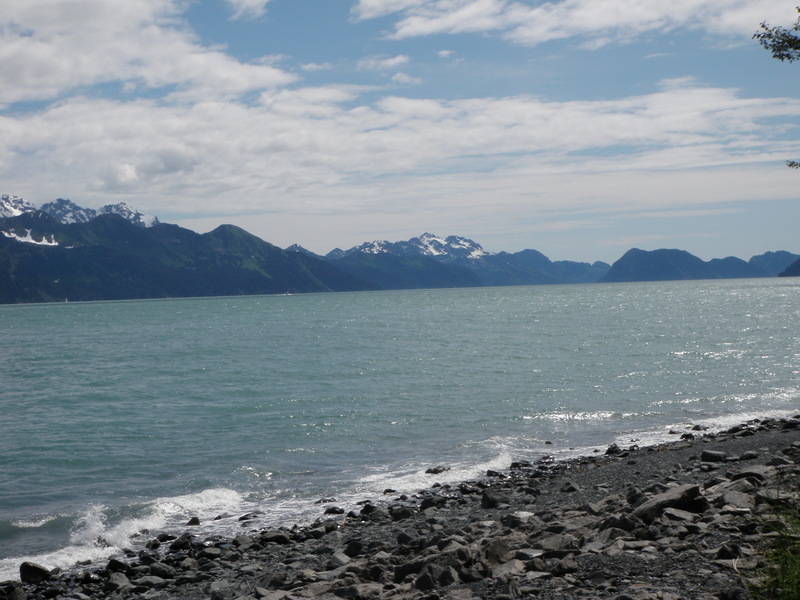 Almost immediately as we moved out of Resurrection Bay we saw two eagles perched on posts. 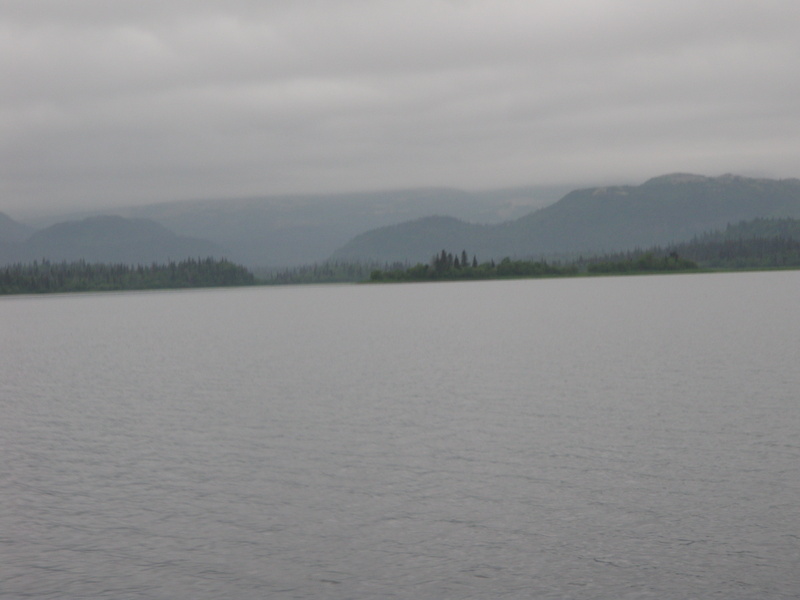 We continued motoring out of the bay and angled toward the opposite shore which contained many rocky points and ledges. Here the cruise ship caption pointed out the many types of sea birds and sea lions. We focused on some puffins which look like flying penguins. They are difficult to photograph because they come up for air and then dive quickly. We decided to move to the fore deck; however, that was quite breezy with nothing to block the wind. I alternated between the deck and going back inside the cabin when we were moving and there wasn’t much to see besides the landscape. Of course this turned out to be a mistake because as we moved away from the sea lions and birds the captain announced a whale sighting. The passengers already on the fore deck naturally had the premium views while I scrambled to find a gap to take photos. 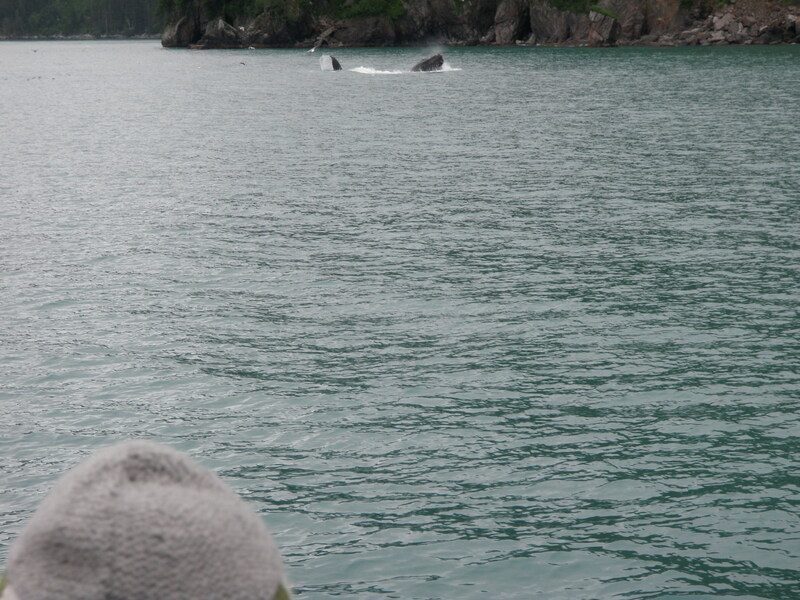 The first whale spotted was a humpback whale and like the puffins it was difficult to capture more than the back above the water. 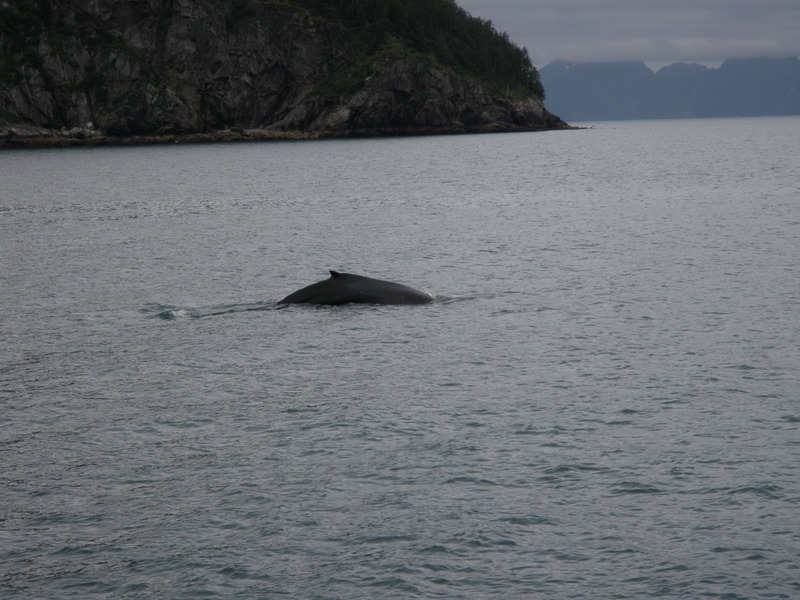 We left the first whale and moved further along toward our destination which was one of the fjords and the glacier it contained. Once again the captain announced a whale sighting and this time it was an orca, but a rare type of orca. I got a nice photo of the mist and spray coming out of this whale’s blow hole. I was riding up front with Jane and she mentioned that she’d seen someone we knew. Can you guess who? No, not Bob, but Beth the young intern who had graduated from Clemson and was sitting in the seat in front of us on the Denali bus. 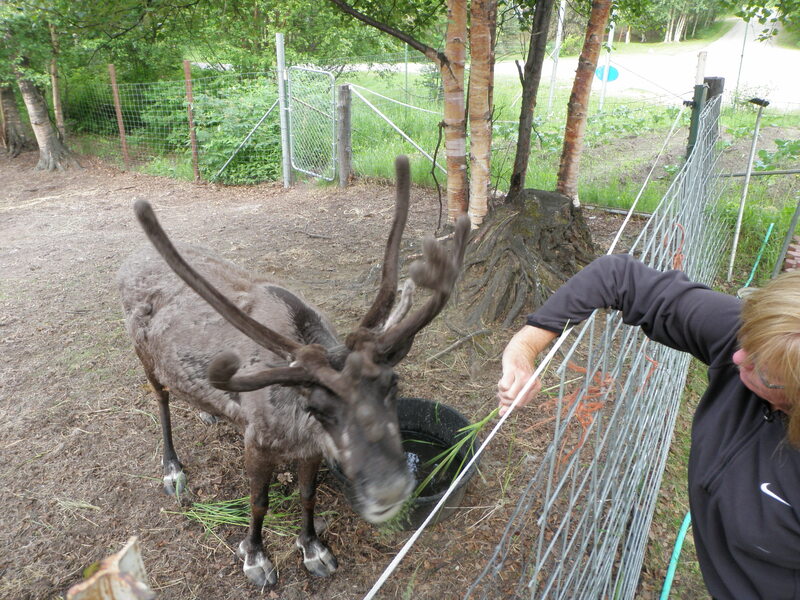 Her parents were visiting and they were doing the cruise before heading north to Denali. 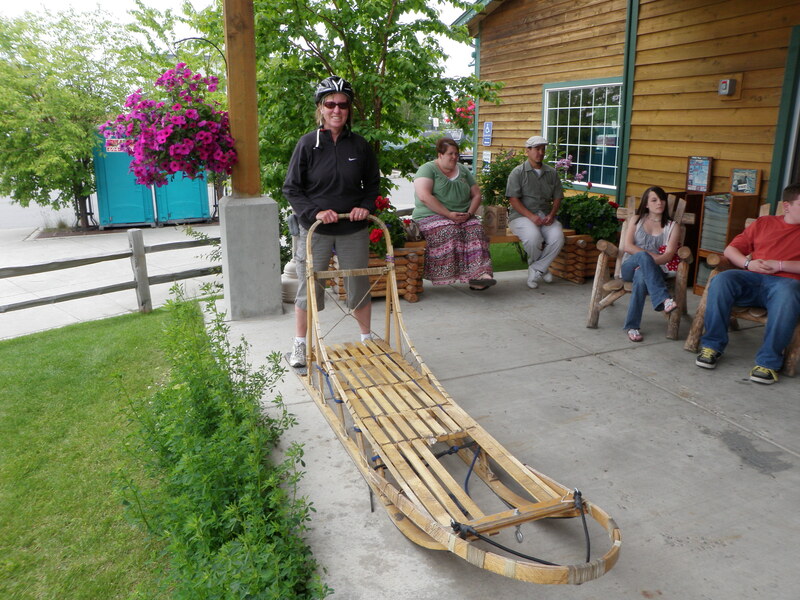 Even though Alaska is a huge place, everyone seems to do the same loop of tourist attractions. We continued on and entered the fjord and drew closer and closer to the gray-white mass of ice that filled the valley and reached down to the water. As we neared the glacier the captain announced that we needed to be cautious to avoid all the mini-icebergs floating in the bay. Sure enough they were everywhere and occasionally one could hear them clanking against the hull. I noticed some movement ahead and spotted a sea otter swimming past us in the frigid icy water. 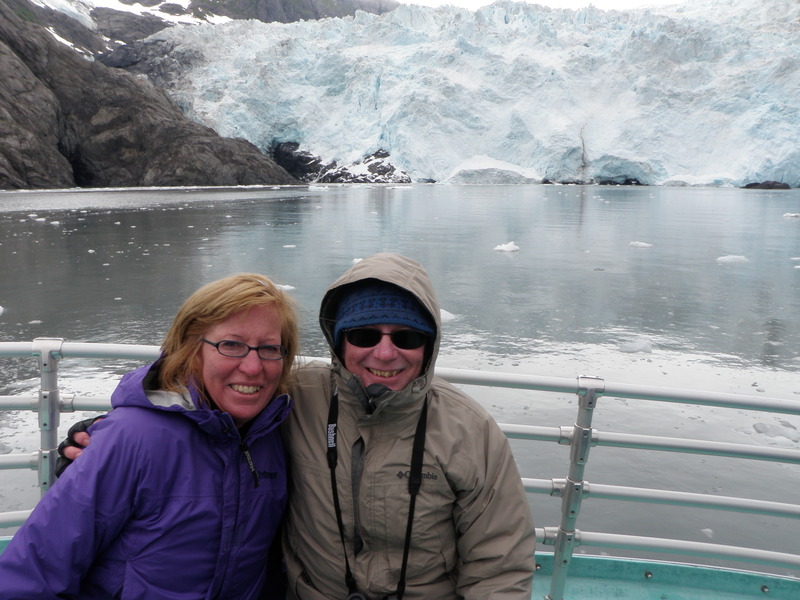 When we drew within 50 yards the captain cut the motor and we watched the glacier. This may sound boring but we were anxiously anticipating calving. 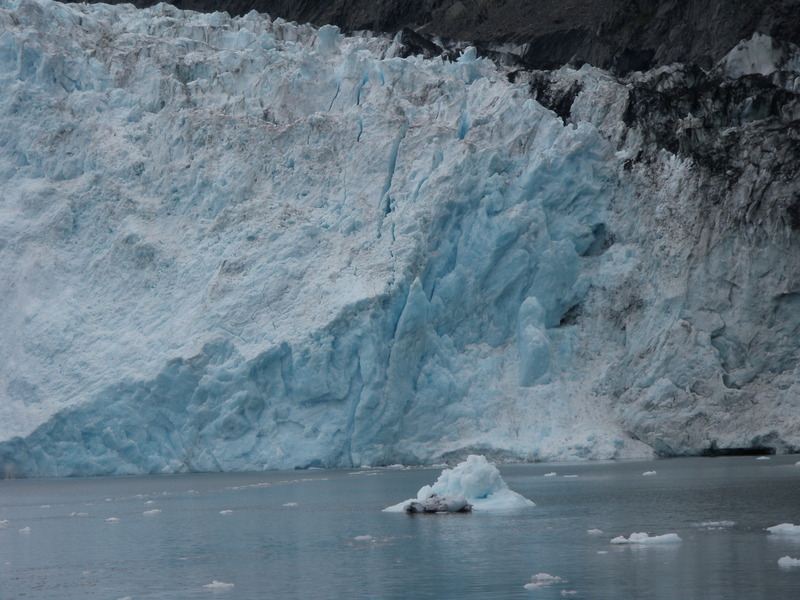 Calving occurs when slices of the glacier split off and slide into the ocean. There were some fairly deep fissures on the right side that forecast calving, but a major event never occurred. We did see some minor slides. 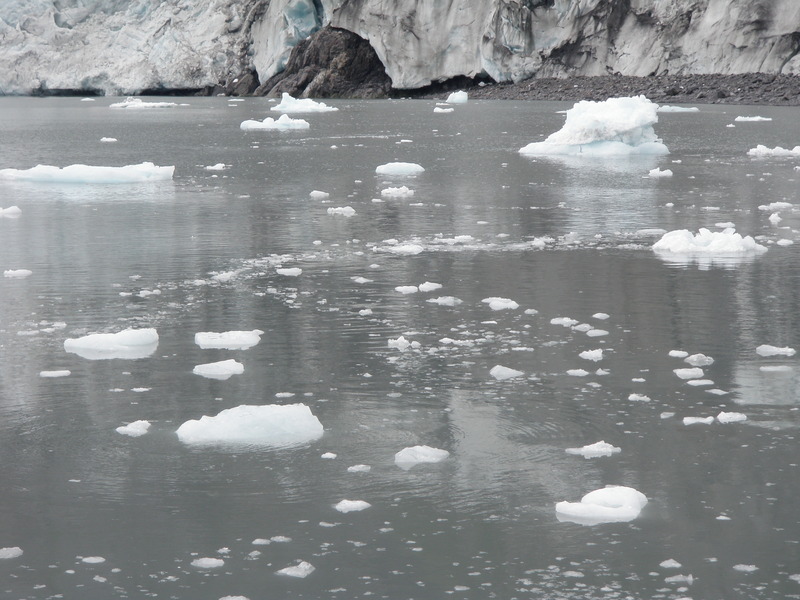 The other interesting thing about glacier watching is how noisy they are. We constantly heard cracking and creaking sounds so it definitely left the impression of a living moving phenomenon. We turned around and began motoring out of the fjord, and I noticed a pair of sea kayaks along the shore. Where did they come from? 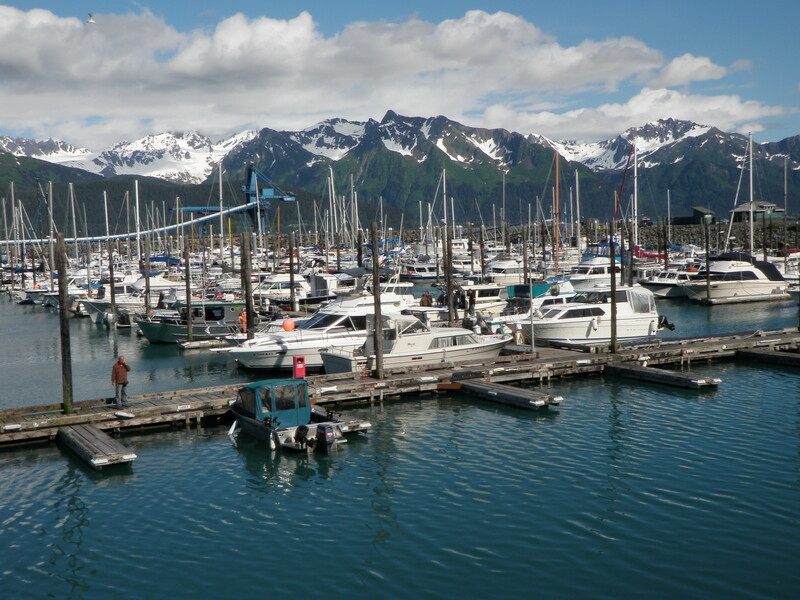 The captain said they get dropped off by a larger boat so they don’t paddle the entire distance from Seward. 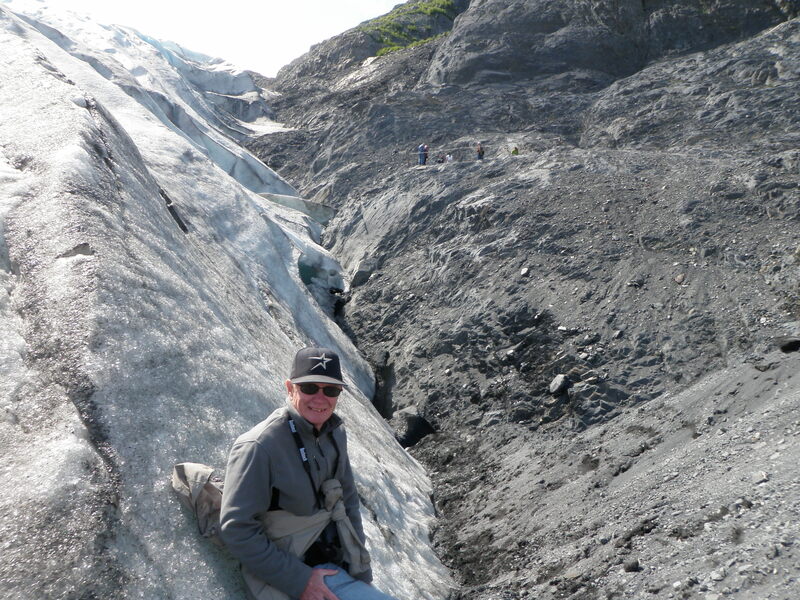 What a neat way to see the glacier. It also seemed like there were scout boats out ahead of us that radioed the captain when they spotted whales. 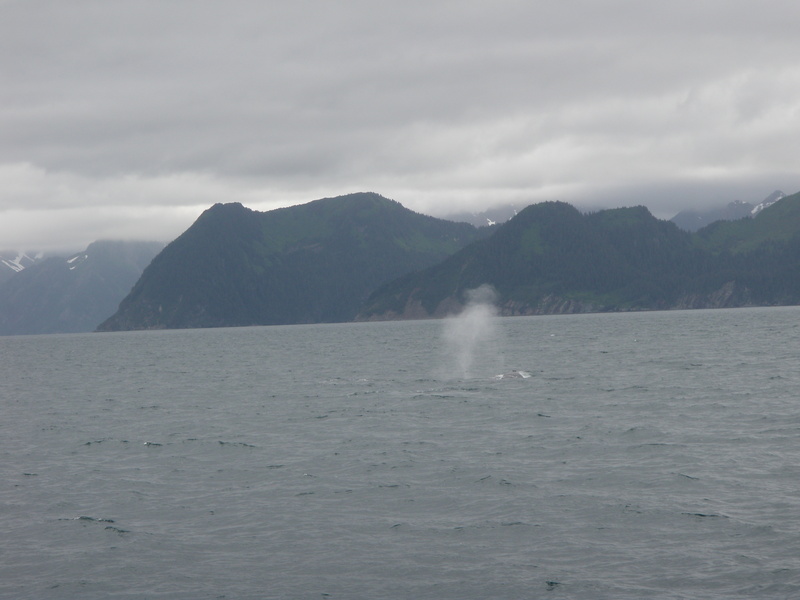 Sure enough as we headed back toward home, the captain announced that two whales were spotted bubble netting. Bubble netting is a technique used by the whales to confuse the bait fish. The bubbles make it difficult for the small fish to see, and then the whales swoop upward with their huge mouths open and scoop up massive quantities of fish. It’s a heck of an appetizer. They also told us this was a learned behavior as the northern hemisphere whales learned it from their southern hemisphere friends. I got some pretty neat photos and movies of the whales bubble netting by holding my camera up high above the heads and shooting semi-blindly toward the whale spot. After the bubble netting episode we chugged at a fairly quick pace back to the harbor. 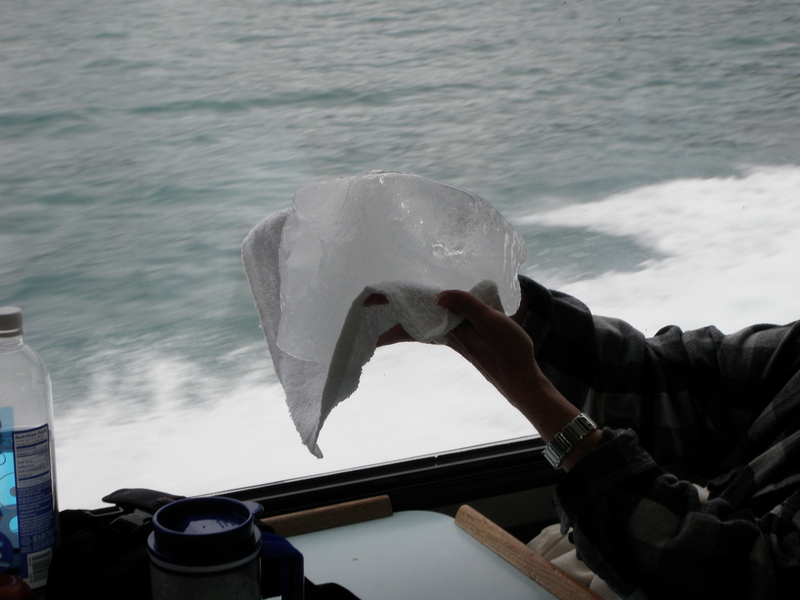 I went to the snack bar for a cup of tea, and one of the cruise ship assistants had one of the icebergs that she’d netted and people were looking at it up close and touching it. 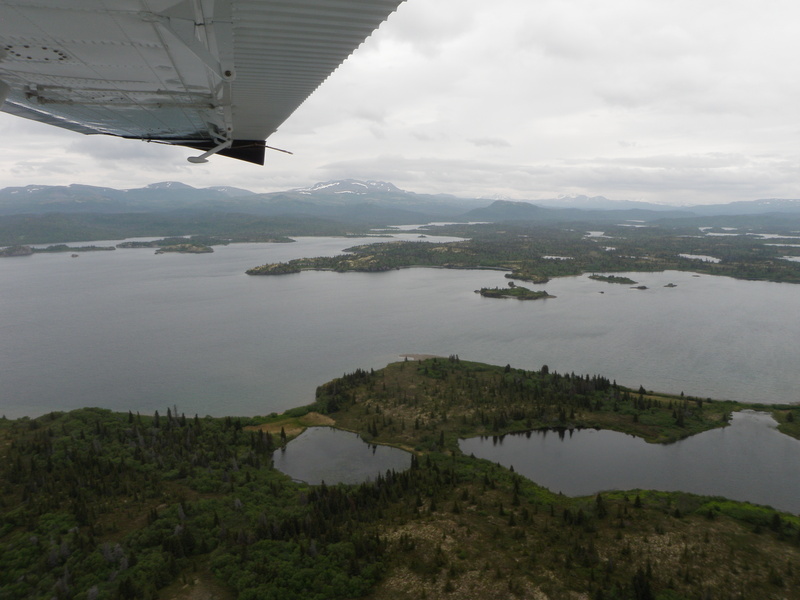 Once we landed we returned to the car and stopped for gas and departed Seward. Our scheduled lodging for Thursday night was Soldotna which was across the Kenai along the Kenai River not far from Cook Inlet. 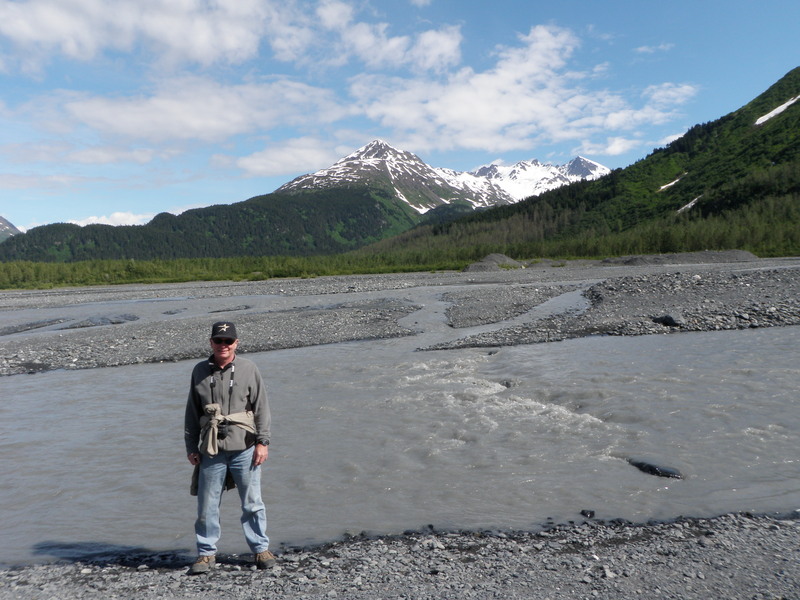 We backtracked on the same road we’d traveled on our way to Seward, but before Turnagain Arm, we made a left turn and it wasn’t long before we were in Cooper Landing and then traveling along the Kenai River. 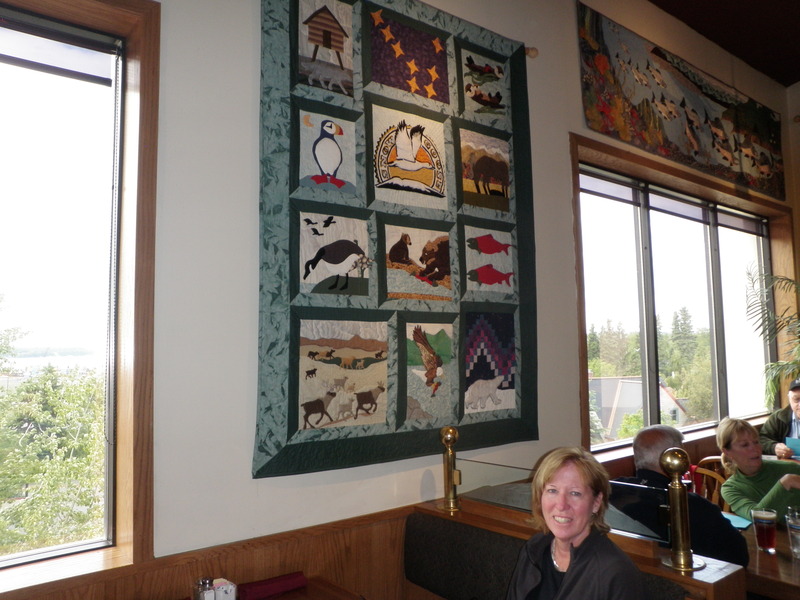 As we got closer to Soldotna we saw a small visitor center cabin for the Kenai Wildlife Area so we stopped to see what the area had to offer. We chatted with a sweet young lady who had lived her entire life in the area, and she gave us a brochure and recommended some of the trails in the area and detouring off the main paved road and taking a well maintained dirt road. 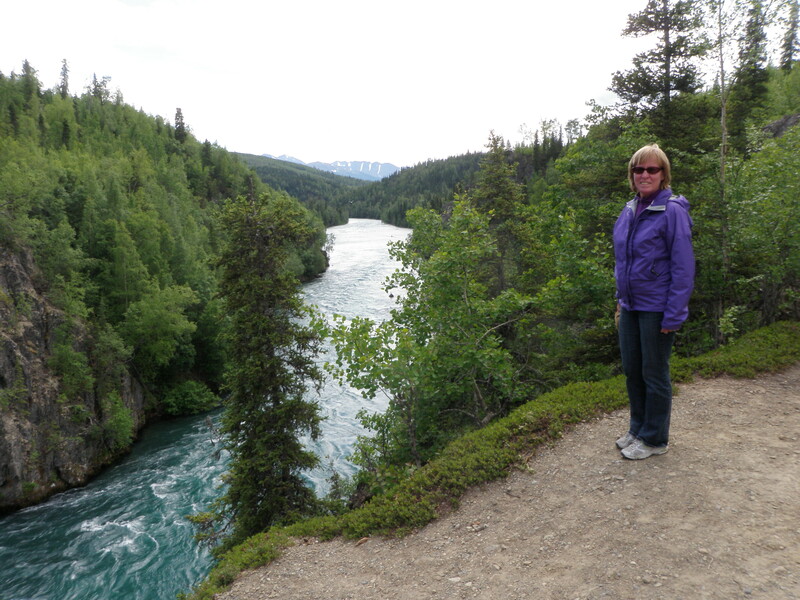 We did this and stopped fairly early and did a short hike on the East Kenai River trail to an overlook high above the turquoise colored Kenai River. Once again we were on guard for bears as Donna told us there had been quite a few during the first wave of sockeye salmon which had just passed. 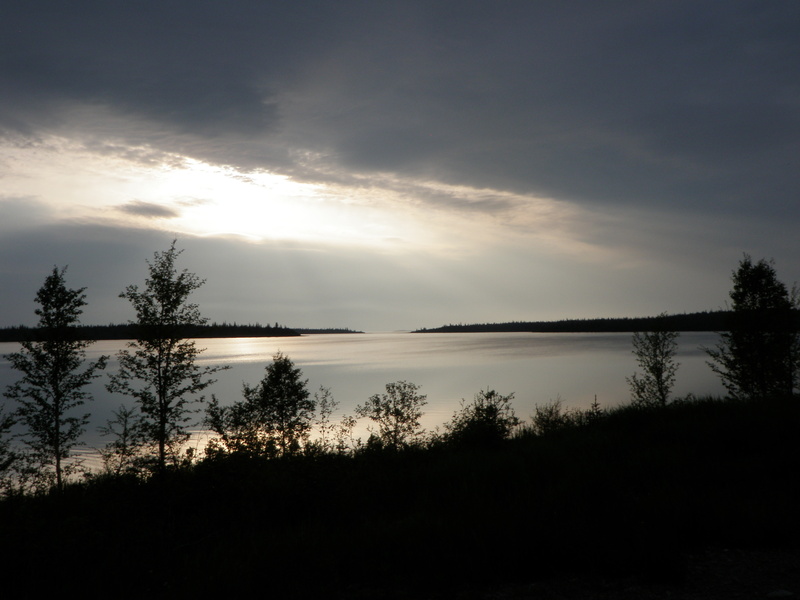 We hiked back to the car and continued on the side road through the wildlife area and then after approximately 16 miles we merged back on the main road and continued on to Soldotna. 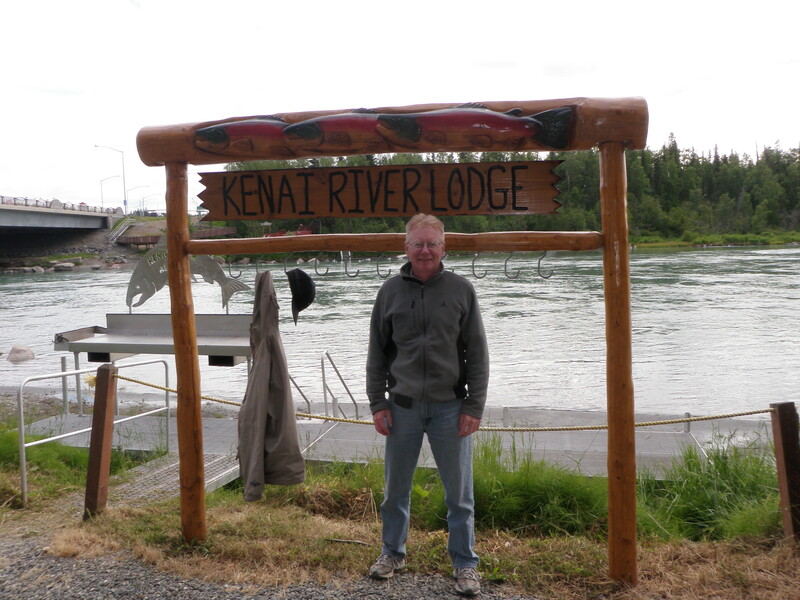 We found our Kenai River Lodge just off the main road and positioned next to the Kenai River. 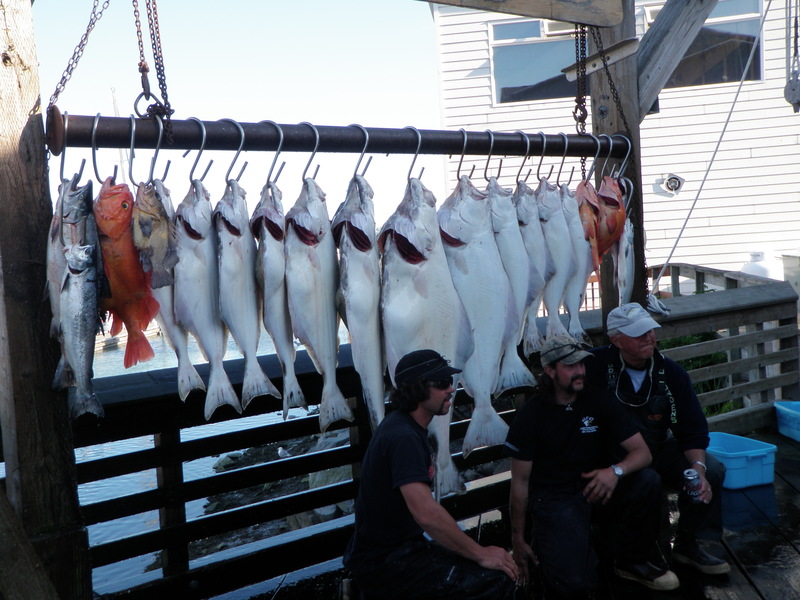 We walked behind the hotel and checked out the fish cleaning table and the array of hooks available for hanging your catch. After returning to the room we researched our Soldotna book and found a couple restaurant choices. We elected the St. Elias Brew Pub and it turned out to be a good choice. There were two musicians playing guitar and singing and we sampled the brew and had a hearty meal. Jane booked two nights at the Arctic Fox Inn in Anchorage, so we stayed there again on Sunday night. 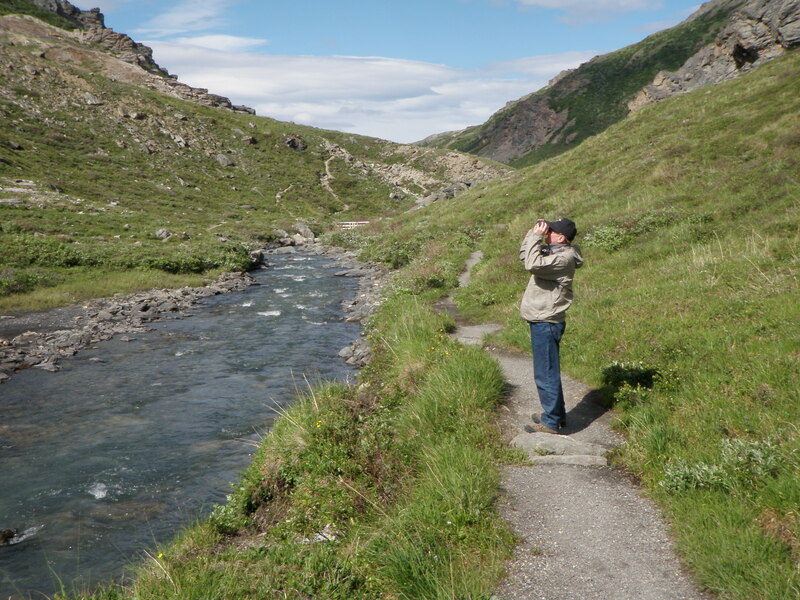 The itinerary called for a day of travel to Denali National Park on Monday and lodging was reserved at the Healy Family Cabins 12 miles north of the entrance to the park. Amy and Dan backpacked in Denali two years ago, and after seeing their photos and hearing their stories, we wanted to include this stop on our trip. 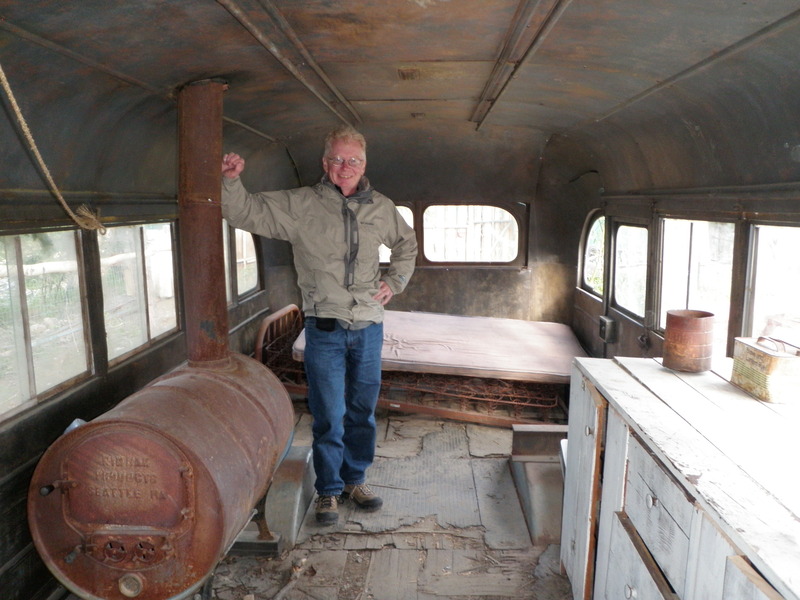 Jane also reserved seats for us on the Denali National Park shuttle for Tuesday. Once again we enjoyed a delicious breakfast at the Arctic Fox on Monday morning and then set out on our drive. Drive time from Anchorage to the park was estimated to be 4 hours. Once again it was a cool partly cloudy day with temperatures in the mid-60’s. On the way north I read about the town of Talkeetna so we made a slight detour. It is a small town that mountain climbers use as a staging point for attempts to summit Mt. McKinley. 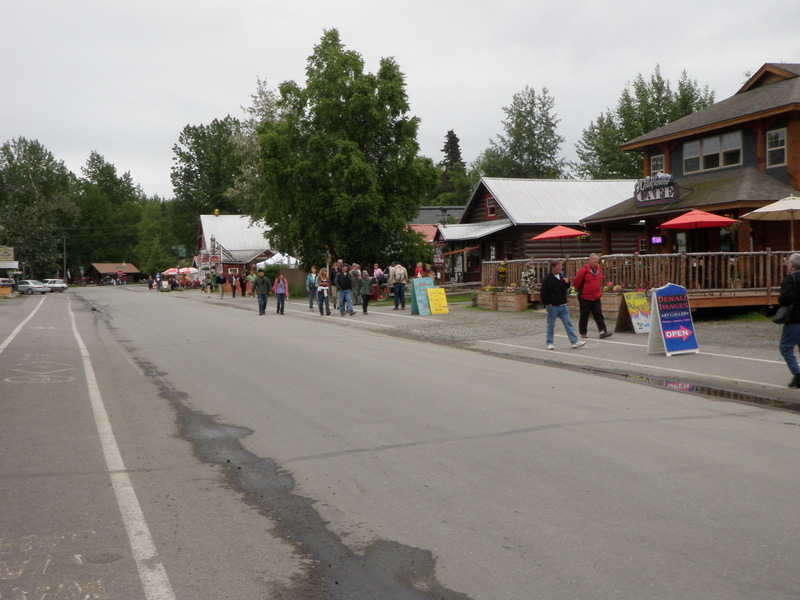 Small shops and restaurants lined the two streets, and a bunch of tourists had just arrived via the Alaska Railroad. We went through town and parked and hiked out to the shore of a huge river that flowed by the town. We then met a couple from the Philadelphia area who suggested we hike up to a railroad bridge because four eagles were visible. We did this but couldn’t spot anything other than some seagulls soaring above the river. 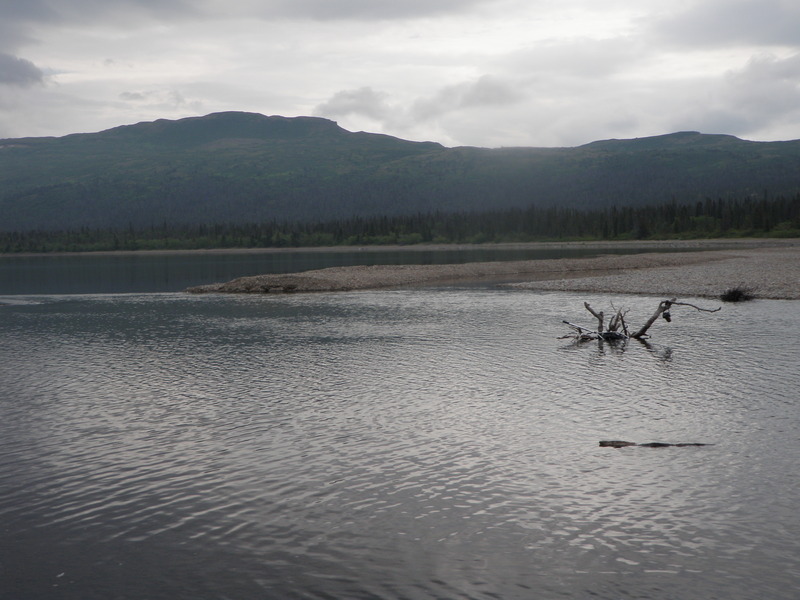 We returned to the car and reversed course back to the highway and continued north to Denali. When we reached the park we stopped and confirmed our reservation for Tuesday and then continued on the main road within the park. Passenger cars are allowed to drive the first 15 miles, but then access beyond that point is only by buses. 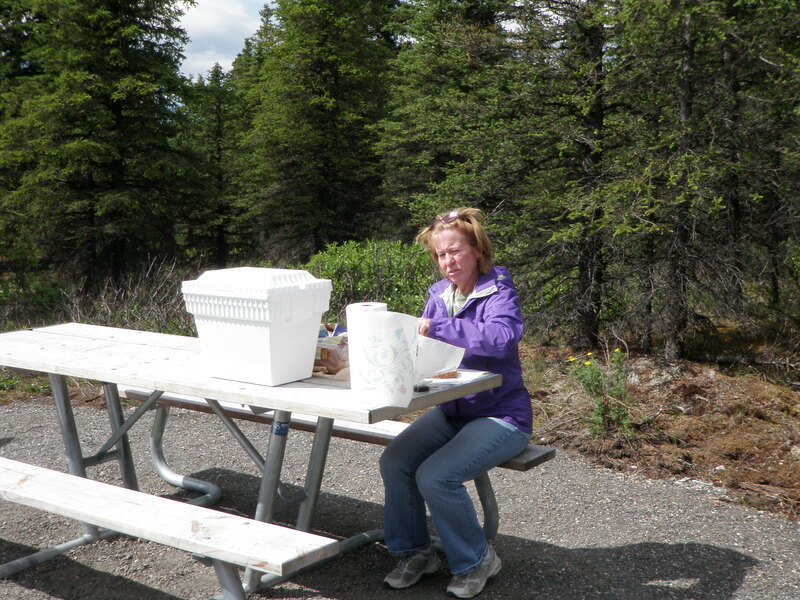 We decided to stop at the Mountain Vista picnic area and eat our lunch. We pretty much had this area to ourselves and then took a short loop hike at Mountain Vista. Jane made friends with a bird by feeding it an orange slice. 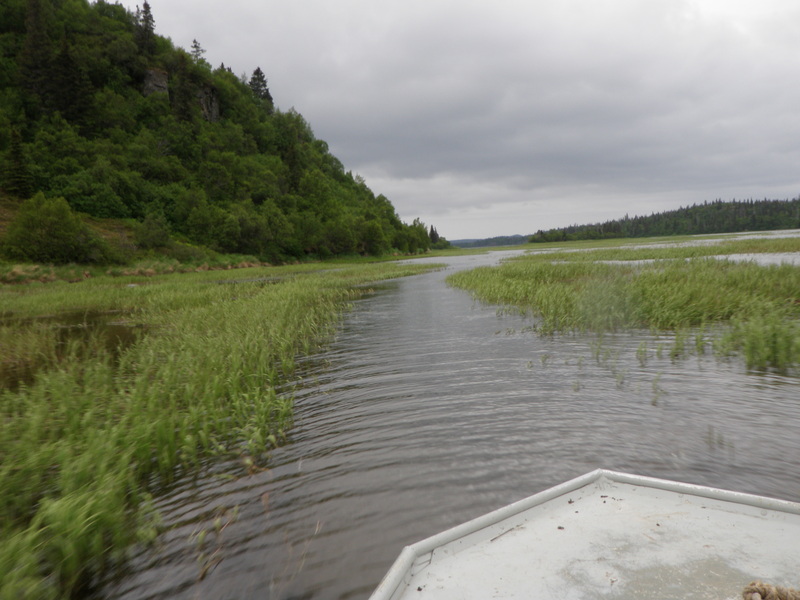 After lunch we continued toward Savage River which is the furthest point that can be reached via passenger car. Several cars were stopped on a high turnout overlooking the river, so we stopped and spotted three caribou in the river bed. We then continued a short distance and parked at the trailhead for the Savage River loop. 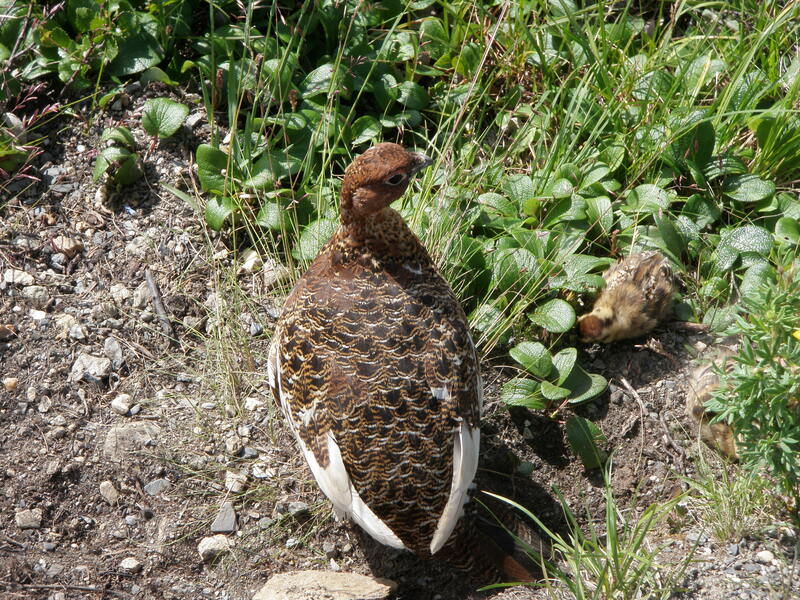 While doing this short 1.5 mile loop we encountered a family of grouse-like birds that we think were ptarmigan. The adults were on the hiking path attempting to nudge all the young ones off the path. Once we completed our hike, we returned to the car and drove back to the main highway and then north and found our cabin. 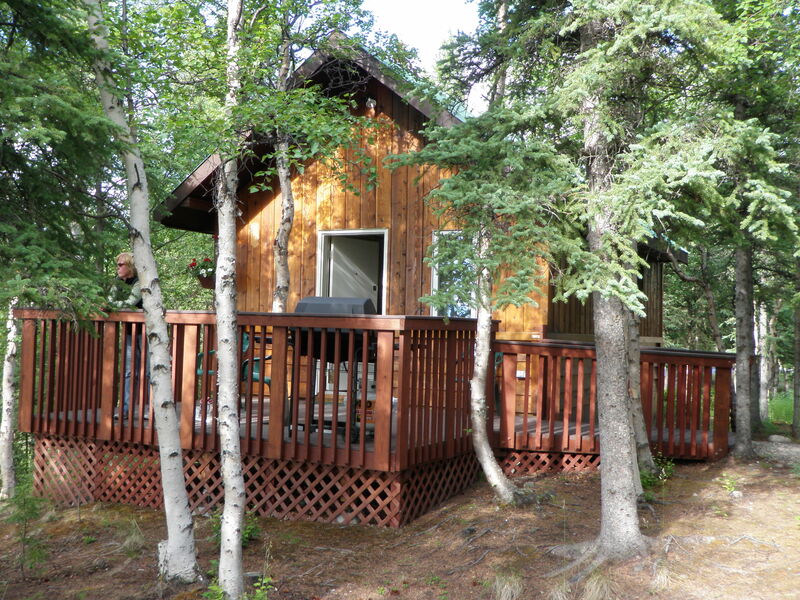 It was a cute little one room cabin with a deck in a neatly landscaped evergreen forest. I read about the restaurants in the area and there appeared to be only one viable option in Healy, a brewpub called the 49th State. We went in search of this establishment and found it along the highway. It was set back from the road and looked like a converted warehouse. Once we entered it was quite rustic with all sorts of backwoods decor on the walls. We both had huge salmonburgers for dinner. They were so large that we wondered where they obtained such giant rolls. The menu mentioned that the bus that was lived in by the character in the book and movie Into the Wild was parked outside the restaurant so on the way out we boarded the bus and took some photos. We returned to our cabin and got a good nights rest before our planned day enjoying the shuttle ride in Denali National Park. Jane and I awoke on Sunday morning in our nice room at the Arctic Fox near downtown Anchorage. Our plan included spending the day in Anchorage. We enjoyed a tasty breakfast at the bed & breakfast which included a lot of fresh fruit and met Bob and Judy from southern California. Bob was a retired school teacher, and they were part of one of the cruise tours. We’d read about biking in Anchorage, so we used the iPad to go online and found a bike shop in downtown Anchorage within walking distance. It was looking like a nice day by Alaska standards and for the first and only time in two weeks I wore shorts, but also took along a raincoat. Nice days in Alaska while I was there were partly cloudy skies with highs in the mid-60’s. Jane and I found the bicycle rental shop and watched the presentation by the clerk and rented two bikes. The store clerk gave us maps and a couple alternative routes and a suggested place for lunch, and we headed off. 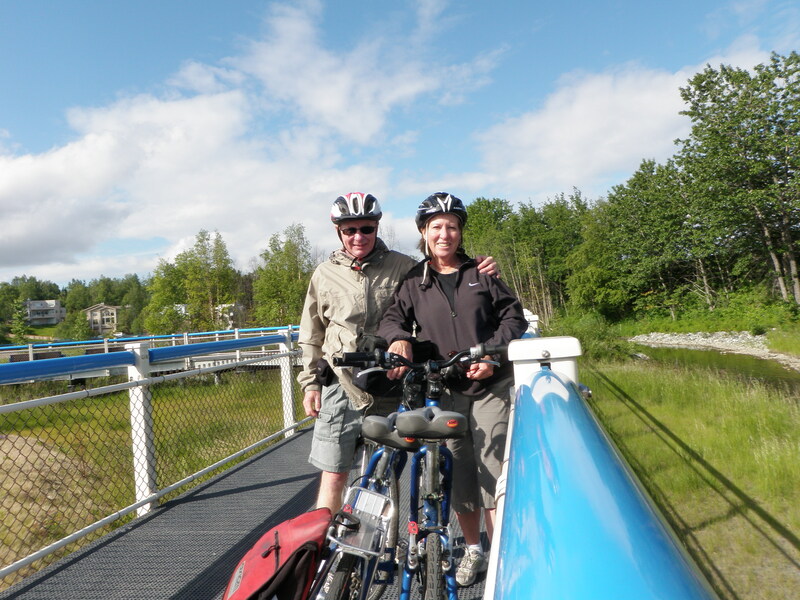 We decided to bike the Tony Knowles Coastal Trail, allegedly the most scenic bike trail in the world. That label was debatable, but it was a nice ride along Cook Inlet for part of the way and then through some forests. The coastal trail ended at Kincaid Park, and then we chose an alternate route back that took us through the airport area with numerous float planes and bush planes everywhere. We stopped at the organic supermarket and had a nice lunch and then returned to downtown. 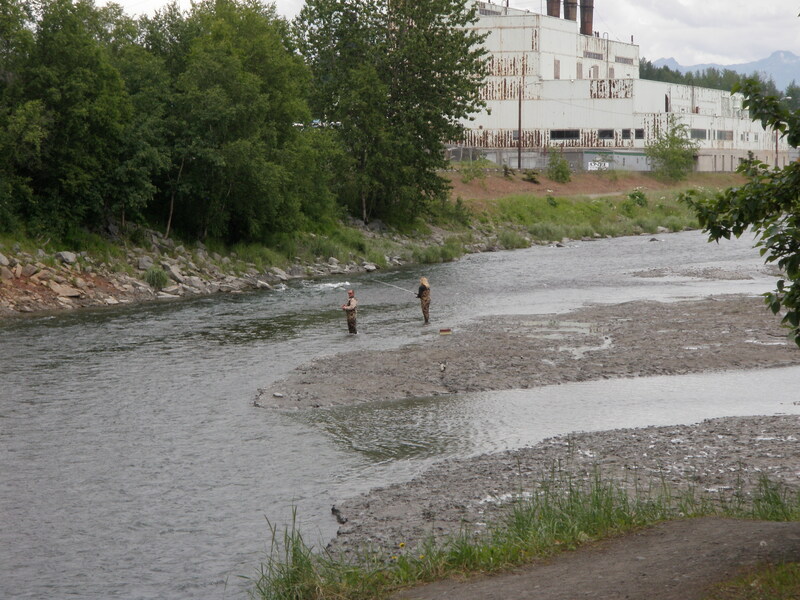 We had more time to bike so we did an out and back along Ship Creek and saw quite a few fishermen near the city. On the return we stopped at the Ulu Factory and purchased an ulu and cutting board. After returning the bikes, we walked over to the farmers market we’d spotted and browsed the stands. 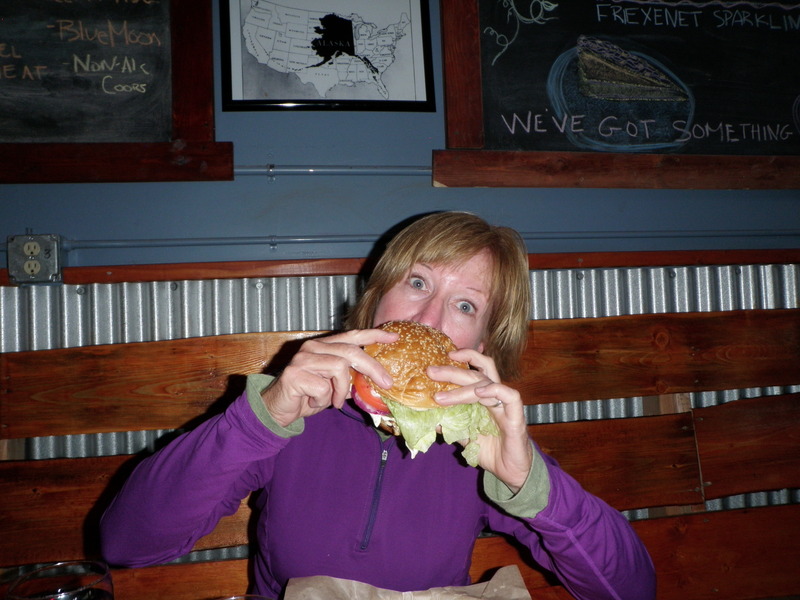 We spotted a place called The Snow Goose and checked that out as a dinner destination. We went back to our rooms and cleaned up and then in fact drove to The Snow Goose for dinner. We liked the atmosphere of this place, another brew pub, better than the Glacier Brewhouse. 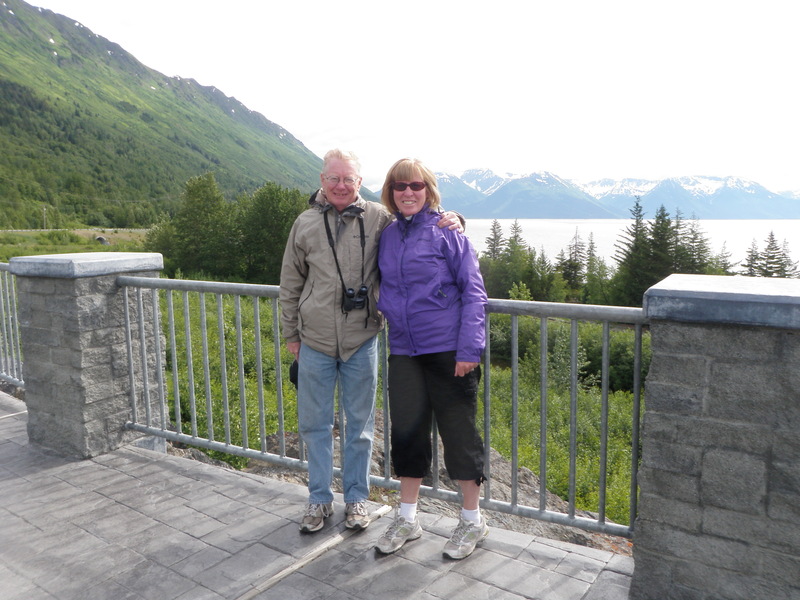 We read about the wildlife viewing south of Anchorage along Turnagain Arm, so given the abundance of daylight we drove the Ford Escape south as far as Alyeska Ski Area and then returned. 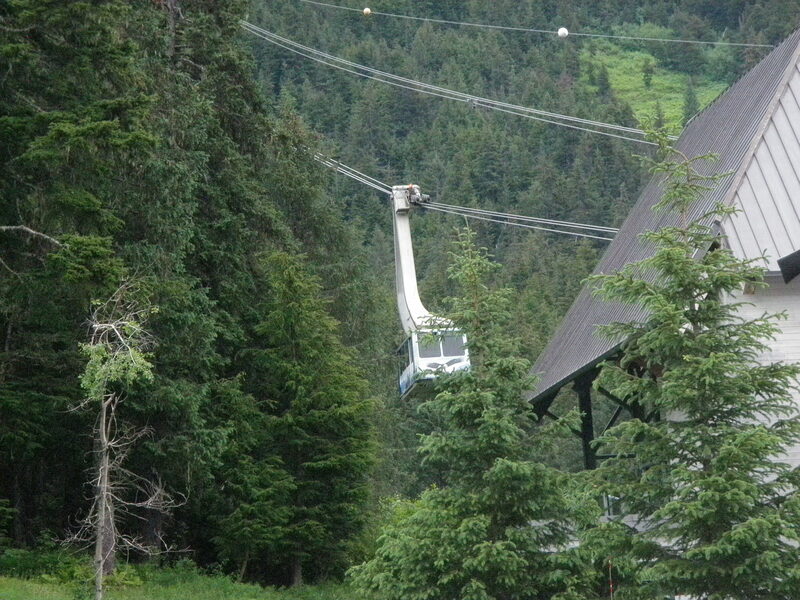 The scenery was breathtaking and we walked around the ski area a bit at the tramway base. We also stopped at the boardwalk by Potter Marsh on our return trip and walked as far as we could go, but didn’t really see any wildlife. By this time a light rain was falling. 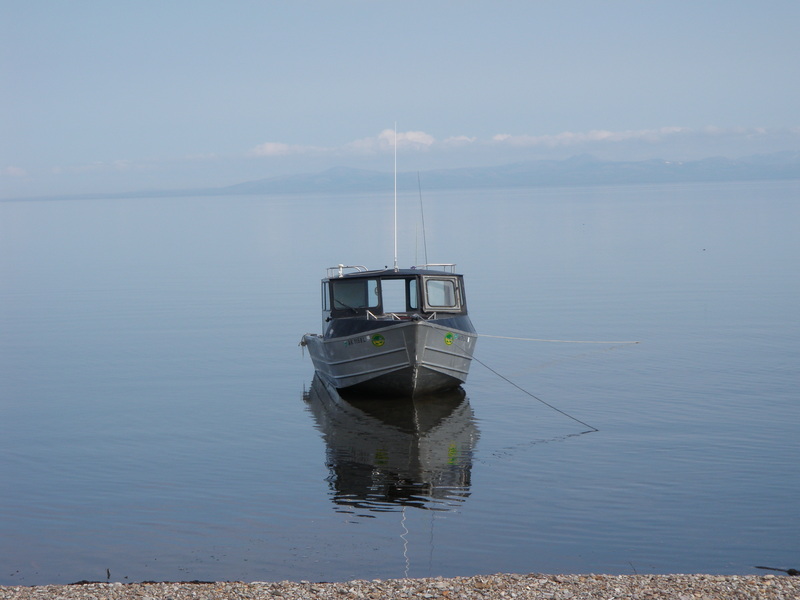 Saturday was my last day of fishing in Alaska in 2011. I woke up to overcast skies and spitting rain, and it was quite chilly. Jordan and I were behind Dr. McKenzie but slightly ahead of Michi, Don and Mike. We did the grass cut off on the way to the Copper and went upstream beyond where Dr. Steve was fishing to the sweet long run where I’d had so much previous success on Tuesday and Wednesday. We started off with the indicator and double nymph rig including a rubber leg pheasant tail and white flesh fly on the bottom. 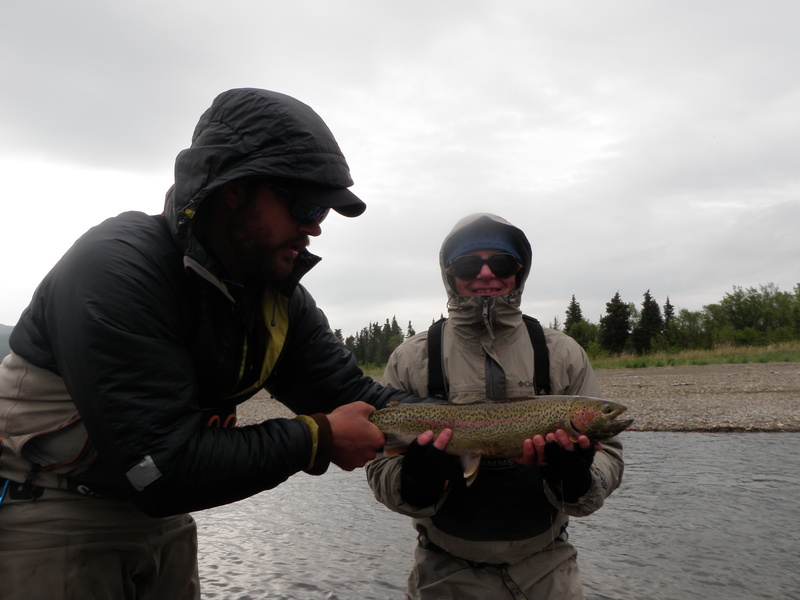 I landed six relatively small rainbows by Alaska standards with the largest being a decent 15” fish. I was executing the stack mends like a pro at least compared to my efforts at the beginning of the week. I also learned to strike and then let the drift continue from the place I stripped the fly to on the hook set. 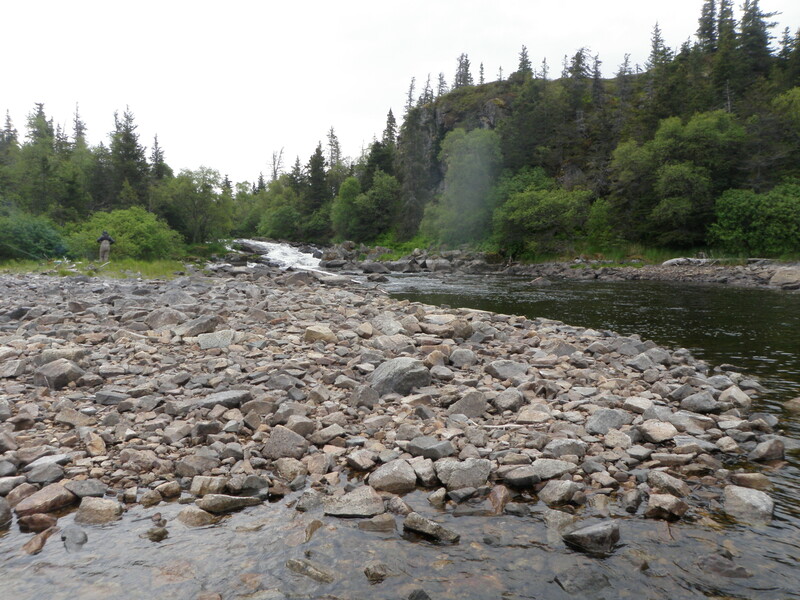 After covering the long sweet run, we moved to a stretch further upstream where there was a long run and fished the left side facing downstream. I hit a pod of Dolly Varden and landed around six in the top half of the long run. Some of the Dolly Vardens took the flesh fly and several grabbed the pheasant tail. Halfway down the run the current angled toward the bank and the water got significantly deeper. 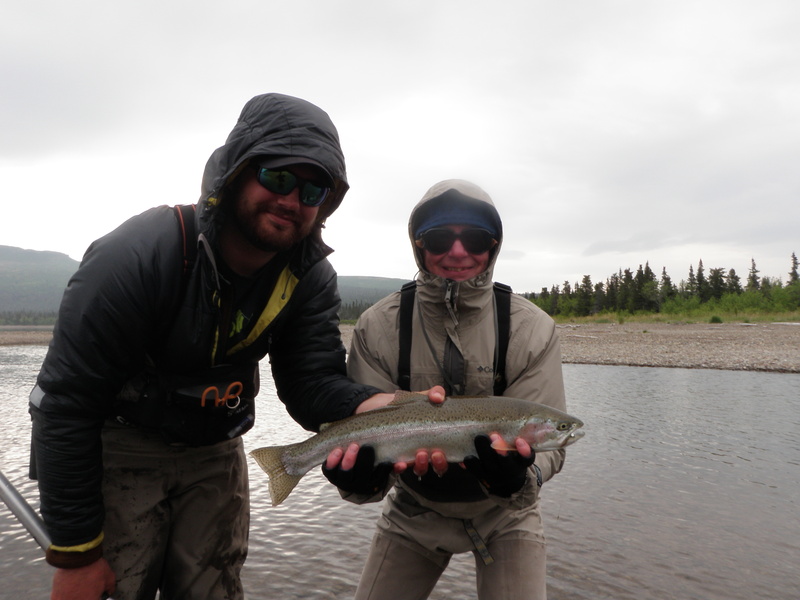 Jordan switched me over to streamers for deeper water as we expected some larger fish, and I landed three rainbows, but again they were small by Alaska standards. I started with the fry fly and then went to a white and brown streamer, and finally a purple leech. The purple leech produced the fish. We again jumped in the boat and headed further upstream and I landed a small rainbow on the nymphs. Next we crossed over to the “other side”, a separate channel that we had not explored all week. Jordan was checking the weight of the fly and demonstrating the way to fish this smaller channel when he hooked a beautiful rainbow that I played and landed. This one didn’t count, but it was still fun. I watched as Jordan walked down the stream along with the indicator and nymphs out ahead of him. Finally I hooked and landed my best fish of the day in a spot below where Jordan caught his fish. The current cut a deep run and then fanned out before some clumps of grass. I ran the indicator and nymphs downstream from above using the stack mend technique and hooked the fish eight feet above the grass clumps. We called it quits and hustled back to the lodge for 1PM lunch. After lunch we moved our packed bags and equipment to the main lodge room by the door. 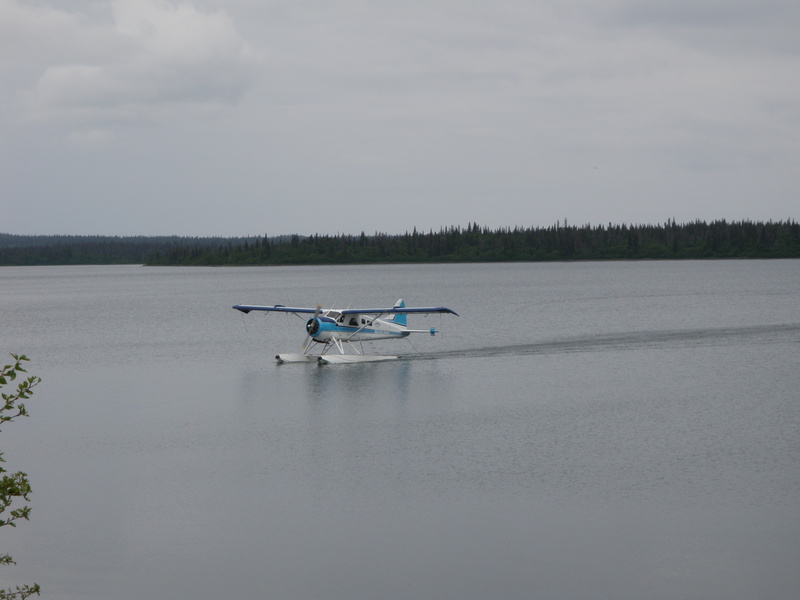 I watched with interest as the float plane approached over the lake from a distance and then smoothly touched down and skimmed to a stop. We all marched out to the beach and took group photos and exchanged goodbyes. Blake the pilot loaded our belongings, and we climbed on the float plane. The takeoff was as smooth as the landing and I snapped several photos of Intricate Bay as we departed. We landed in Illiamna and almost immediately boarded the Pilatus and flew the last leg back to Anchorage. The woman at the counter at the Illiamna Air Taxi terminal ordered a taxi for us and Michi, Don, Steve and I piled in. The driver didn’t speak much English and didn’t know his way around very well, but we managed to drop the three Californians off at the Budget rental building. Now I was stuck in the car with this guy trying to find the Enterprise counter. After numerous wrong turns and asking directions we finally found Enterprise at the main terminal of the airport. I paid the driver a $10 fare and refused to pay for all the excessive driving. I rented our Ford Escape for the week and left it parked in the Enterprise lot while I walked to the baggage claim area to wait for Jane’s flight to arrive. 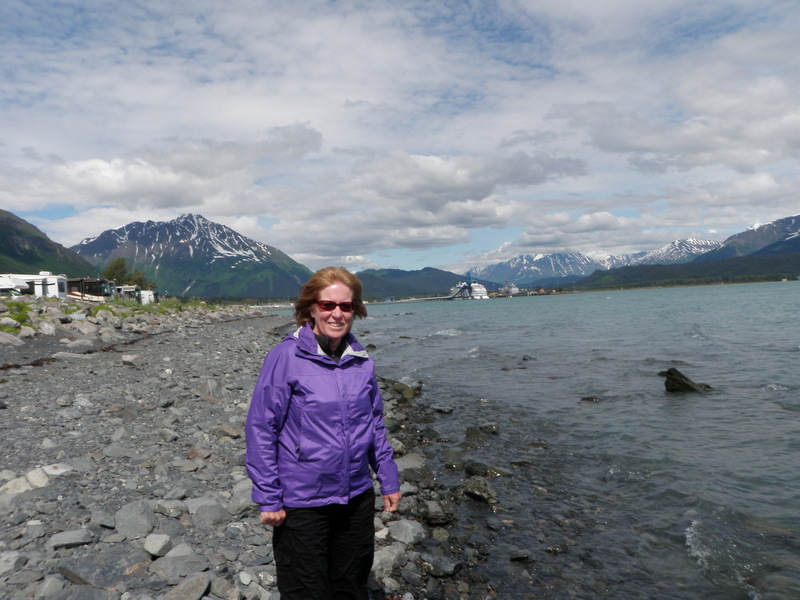 Her Alaska Air flight arrived 40 minutes early, so we walked back to the rental car and drove to downtown Anchorage where we had reserved two nights at the Arctic Fox bed & breakfast. We checked into our nice clean room and then walked downtown seeking a restaurant. We looked at some menus with prices that seemed too high, and eventually ended up in the Glacier Brewhouse, the same restaurant I’d eaten at the previous Sunday night. We had to grab bar seating and were at a narrow table directly across from a couple from California. We ended up chatting with Rebecca and Dave who had been touring Alaska and were about to return to California the next day. We motored over to the mouth of Sid Larsen Creek, and Mark and Jordan gathered wood and built a fire to cook Slam’s southwest chicken stew for lunch. 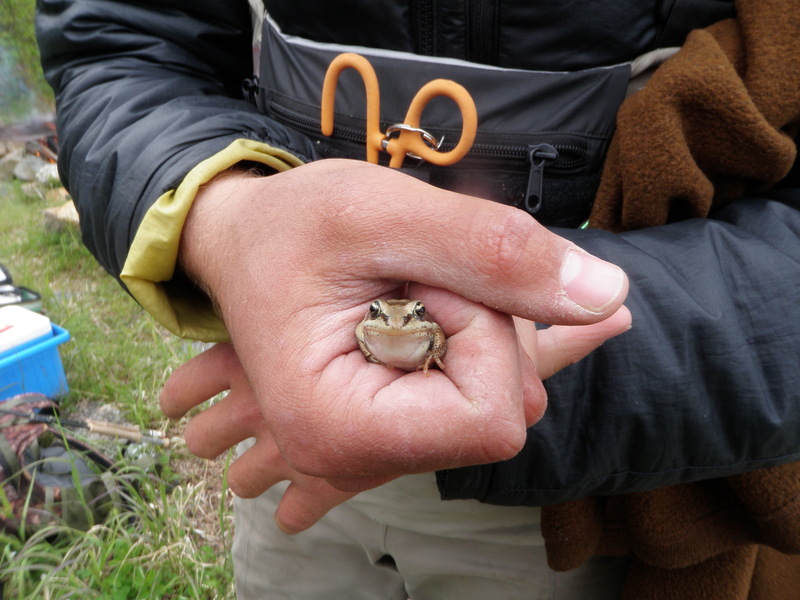 Jordan found a wood frog, and we photographed that before eating lunch. Sid Larsen was a beautiful spot with a waterfall 20 yards upstream from the inlet to the lake, and the trees and bushes came much closer to the lake and stream than Dennis or Tommy Creeks. 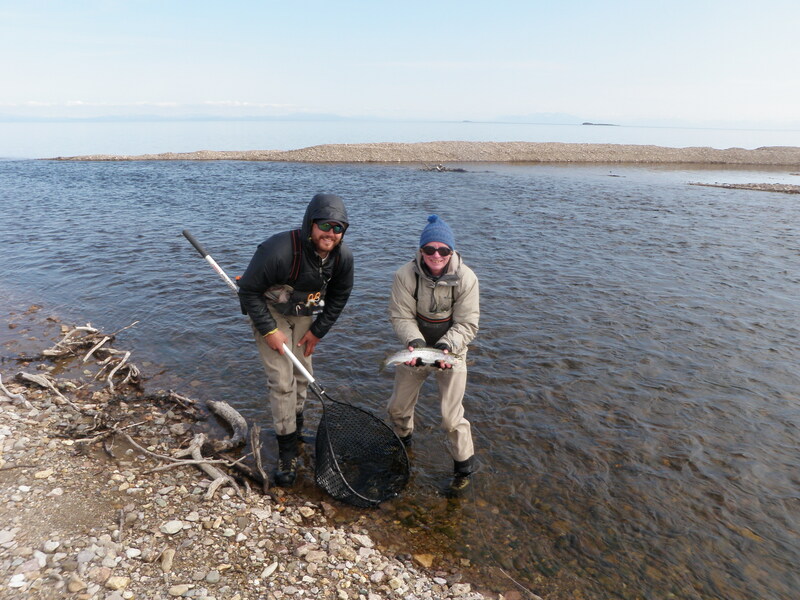 Mark and Jordan said there were many small rainbows and grayling in the pocket water and the large plunge pool below the falls, so we concentrated in the 10 yards of water above the mouth and then the current and run that extended out into the lake. Initially I stripped a white streamer on a sink tip line after making long casts across the creek, but this didn’t produce any takes. Jordan tied on a dry fly, and I caught a bunch of small rainbows, but many were too small to count. I raised my minimum threshold from six inches in the lower 48 to 8 inches in Alaska. Growing weary of the small fish, we converted to indicator fishing with rubber pheasant tail and the flesh fly on the bottom. This produced a 20” rainbow on the flesh fly, but action slowed again and Jordan switched me back to a woolly bugger and then a Clouser-style streamer. I covered the water from the mouth far out into the lake with these flies to no avail. Casting these large streamers long distance really put an ache in my shoulder and back. We finally called it a day around 5PM and motored back to the lodge for dinner. I landed 7 of 10 countable fish at Sid Larsen Creek. On Friday Mark piloted the cabin cruiser while Jordan and I were passengers as we headed to Tommy Creek. 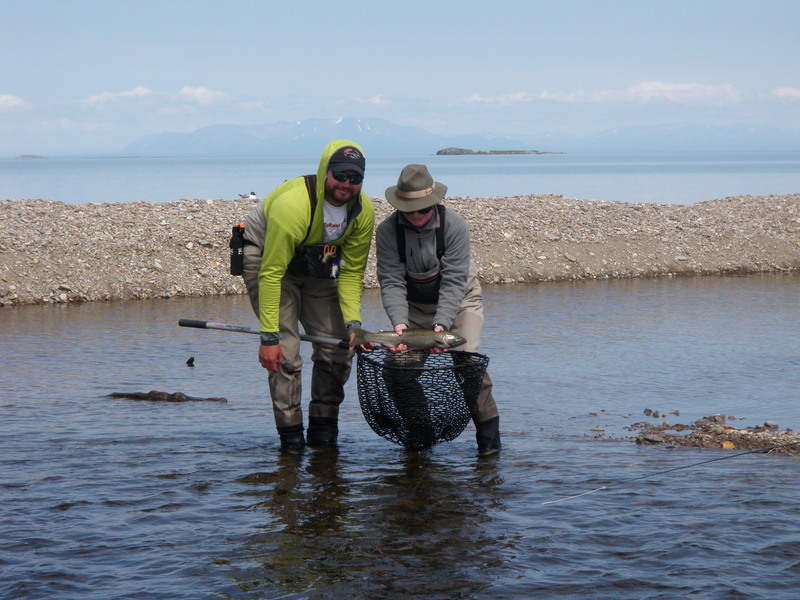 If time permitted, we were also planning to sample Sid Larsen Creek and possibly Big Creek as well. 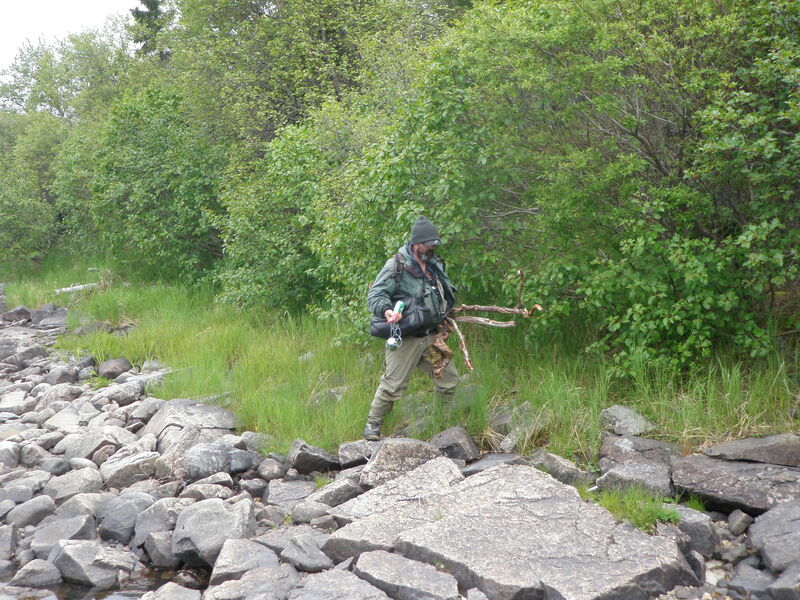 We got off to an early start and arrived at Tommy Creek and began fishing by 9AM. 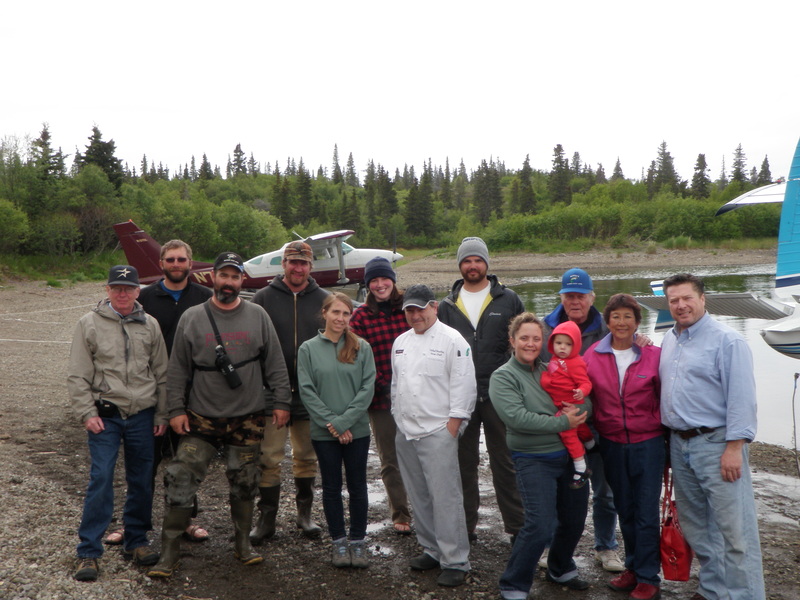 The rest of the crew headed to the Copper River. Mark took his video camera along and filmed quite a bit of my fish catching. He and Desiree promised to send me the DVD once they return to Wyoming in the fall. I began fishing with a white flesh streamer that Jordan tied on his Scott S4 6 weight with a sinking tip line. I was once again making casts across the river to the middle, then three quarters, then the far bank and letting the streamer sink and sweep down and across. Mark and Jordan taught me how to stay in contact with the streamer and watch where the line entered the water. It didn’t take long before Jordan switched to the fry fly he tied the night before. Closer to the mouth of the creek across from a dead limb I hooked and landed my second 24” rainbow trout of the week. 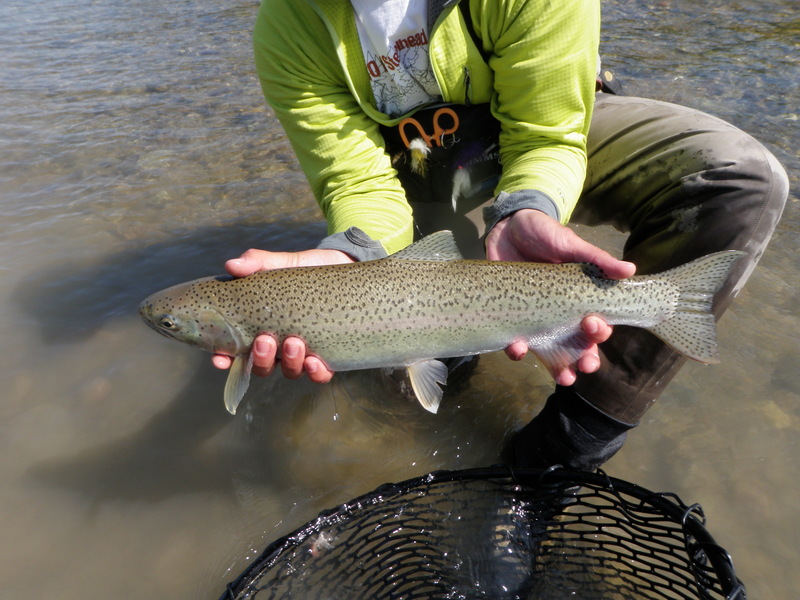 This proved to be a strong fighter and a beautiful silvery fish. Mark and Jordan referred to it as a chromer, and it had sea lice under its fins. Shortly after releasing the chromer another fish hammered the fry fly, and I fought and landed a colorful 23” drop back rainbow. Mark was sure he’d spotted this fish on a previous trip. It was much more brightly colored and was in the process of dropping back to the lake after spawning in the creek. Tommy Creek was surely making an impression on me. I asked Jordan if he followed a pattern to create the salmon fry fly, and he told me he just observed naturals and put together materials to imitate. We spotted some rises and switched to a small humpy-style fly. I cast above a rise and a fine 16” rainbow rose and slurped in the humpy and shortly thereafter I landed a second 16” rainbow on the dry fly. These would tie for my largest fish taken on dries during the week. After landing the two trout on dries, rising activity slowed so we switched to indicator nymph fishing with the rubber leg pheasant tail on top and the white flesh fly with a red stripe in the bottom position. This produced a couple nice fish including a 20” rainbow that munched the flesh fly. It was during the nymphing that I became more adept at casting across the river and making a big mend and then feeding line out while making rapid stack mends. This enabled extremely long drag free drifts downstream into the meat of the run. I landed 11 of 14 fish hooked at Tommy Creek including a 24 inch chrome, and 23” drop back, and another 20 inch fish. It was quite a morning. 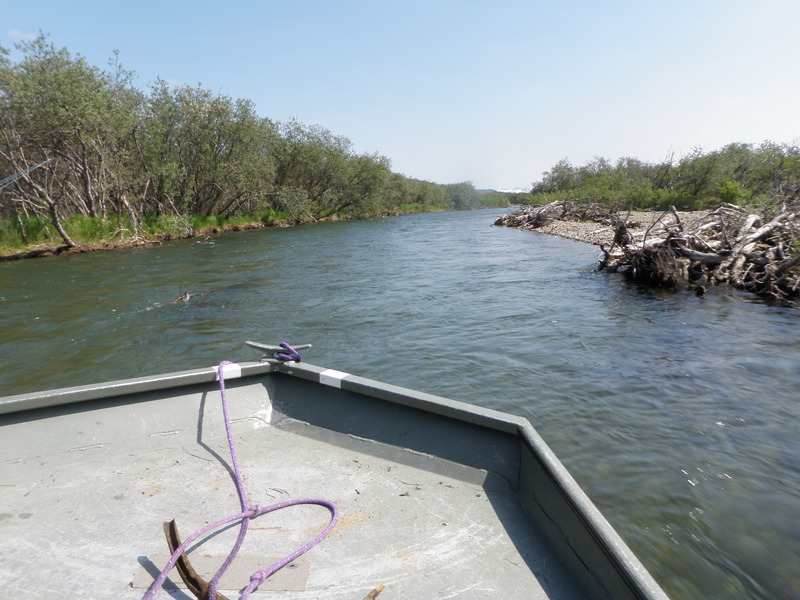 Mike, Jordan and I loaded all the gear and lunch supplies into the boat and cruised over to the mouth of Gibralter Creek after lunch. Steve and Jared were there at the mouth of the river waiting for us. Jordan and I jumped in the jet boat, and Mike shuttled us upstream to a spot that Jared recommended where they’d had action in the morning. As we approached the target area we noticed some rising fish, so Jordan tied on the black caddis with the pheasant tail dropper, but this didn’t produce. Next we moved to the top of the run where the water wasn’t as swift as most of the river. There was a stretch that was around 15’ wide and 25’ long that proved to be unbelievably productive, and we were now toward the top of this directly across from a dark spot on the bottom that Jordan called submerged tundra. 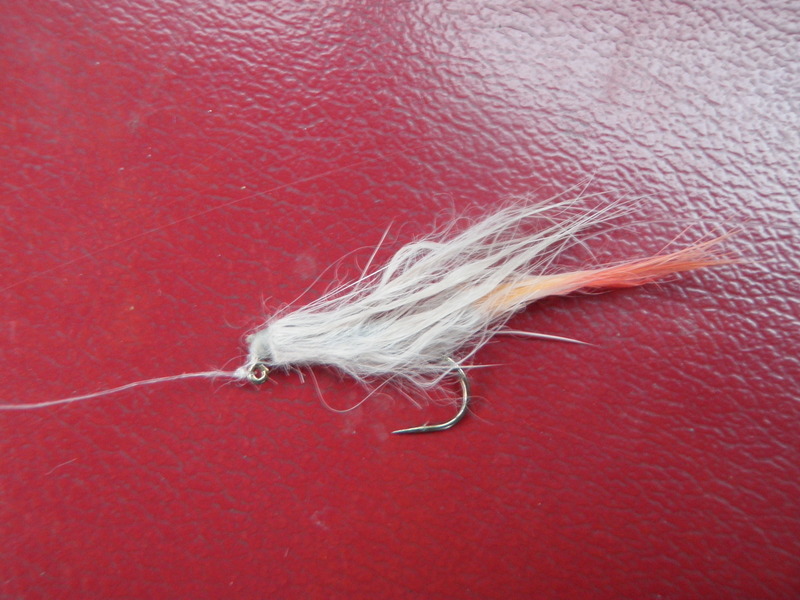 Jordan set me up with the white flesh fly on top and the rubber leg pheasant tail on the end with a strike indicator. Using this combination in the stretch described, I landed 9 of 12 hookups over the remainder of the afternoon. My first three casts yielded medium sized dolly varden, so we thought we’d hit a dolly varden school. 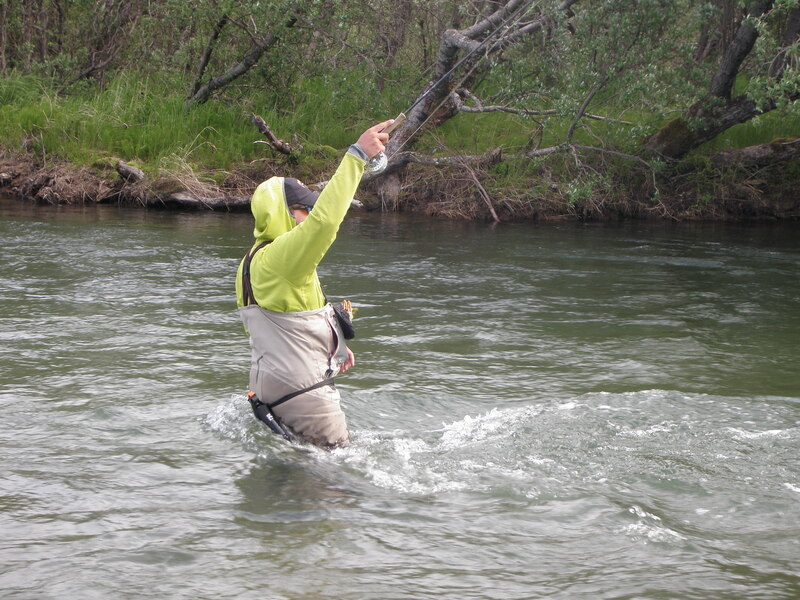 But I continued to fish and started landing larger rainbows from the area directly in front of the tundra spot. The highlight was a 24” rainbow bruiser that spit out 10+ salmon fry when I landed it. This was the largest fish of the trip so far, and in fact the largest fish of my life. 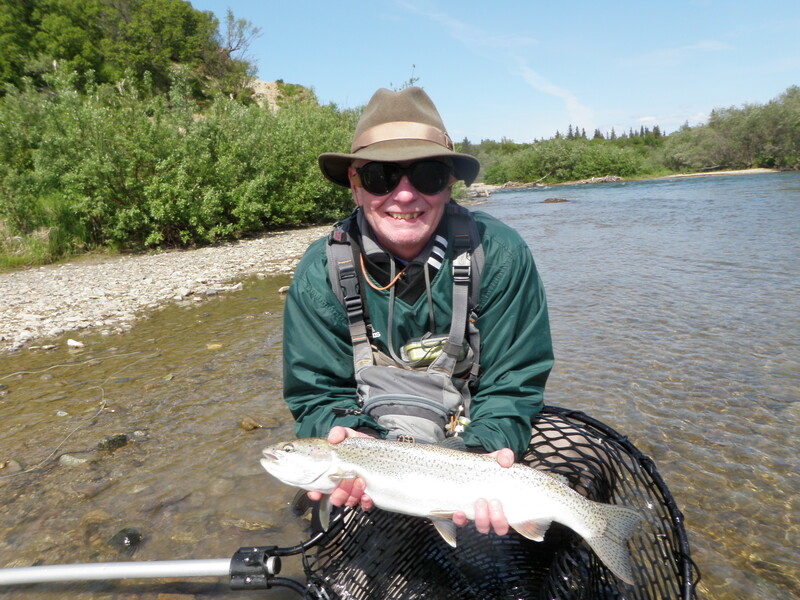 In addition to the 24” rainbow, I also landed two 20+ inch fish, an 18” rainbow and two more dolly varden. 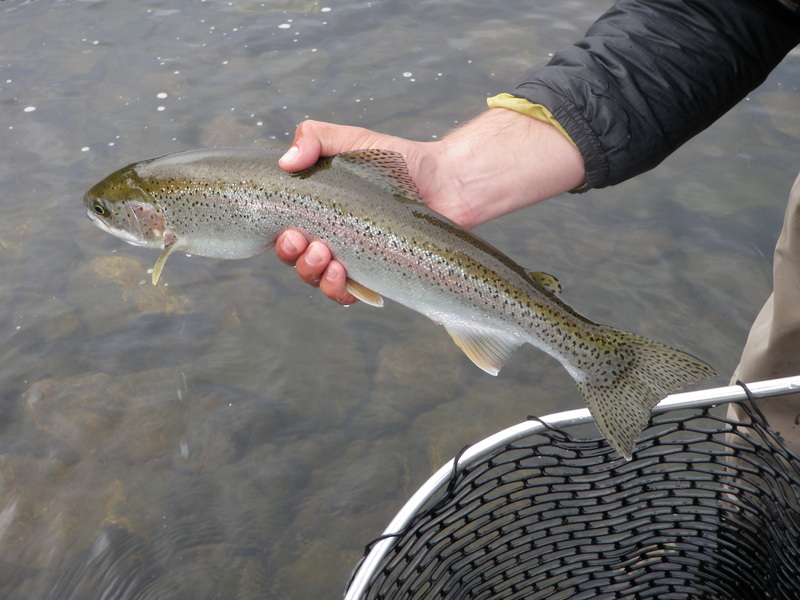 When I hooked the rainbows, they would immediately charge into some very large fast riffles and all I could do was hold on and allow the fish to run and follow them downstream to a point where the stream widened. By applying side pressure I could bring them over to the shallow gravel below me where Jordan eventually netted the fish. Of the nine fish landed, two hit the pheasant tail and all the rest banged the flesh fly. After we’d landed eight or so of the fish, Jordan changed my rig to add more weight and was showing me how to execute the Czech-style nymphing technique by holding the rod high and moving it up and down so the flies would bounce along just above the bottom. He was demonstrating this technique in the faster water just beyond where I’d been fishing as he felt fish were also right on the seam. Sure enough, as he showed me the technique, he hooked a nice fish that immediately raced downstream in the heavy current as mine had done before. I decided to do a role reversal and grabbed the long handled net and started wading out behind him. As I did so, I glanced over my left shoulder and saw a capsized inflated raft floating down the river. 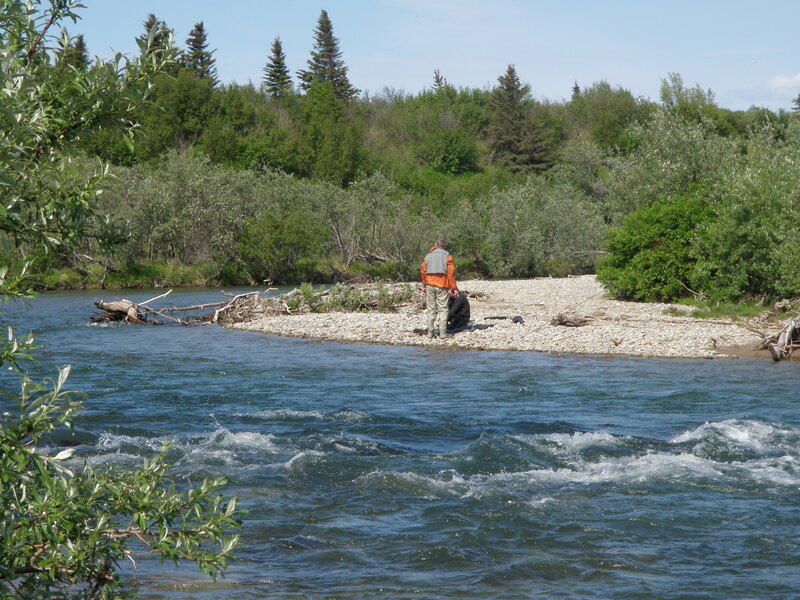 I shouted to Jordan, and he gave me the rod with the fish still attached, and he waded out to the top of his waders and righted the raft and recovered most of the equipment. 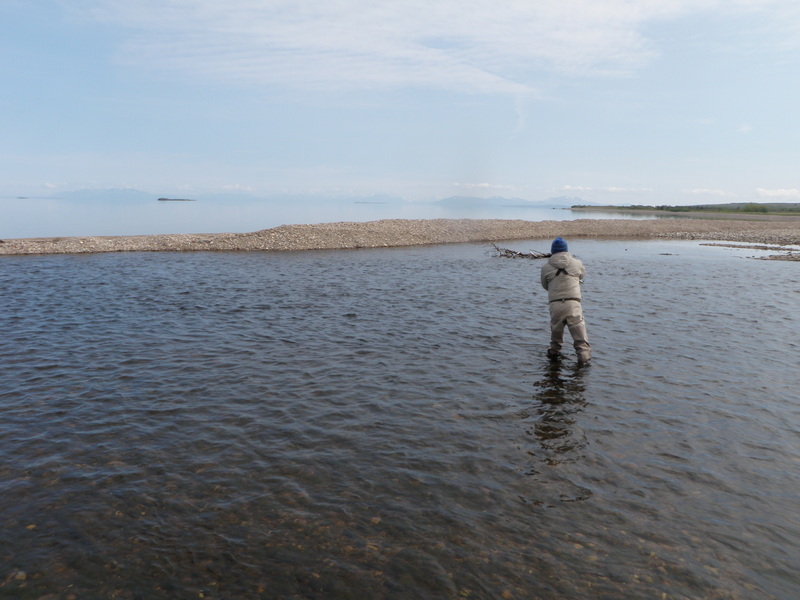 I eventually played the fish around to the shallow shoreline and released it. We looked up the river and spotted three soaking wet fishermen, a guide and two unhappy clients. Jordan helped the guide get across the river. While Jordan was lending assistance, I began fishing again using the technique he demonstrated and hooked and landed one of the 20 inch fish. Jordan was on the high bank instructing the other guide on where to cross and came charging down the bank to help net the last fish. When Mike brought the jet boat up to pick us up, he first took the wet fishermen and their deflated raft to the mouth, and then returned to pick us up. We worked some areas below our hot spot for a half hour or so with no success. We ended our day around 6PM when we got shuttled back to the mouth and boarded the cabin cruiser. Thursday was an exciting day.